Ah, March. Without a doubt, the month that most makes me wish I had a remote control that could fast-forward to the end of all this winter unpleasantness, these last few weeks when the season digs in its heels and stubbornly refuses to leave. I know there are many places on earth where March isn’t that bad, where spring is already knocking at the door (or, even further south, where summer is still lingering), but from my vantage point it couldn’t get much worse. At last count there is at least another month of winter to endure, possibly two if we get really unlucky. And I’m not putting my money on luck after the winter we’ve had, in Europe the coldest for 50 years. 50 years, can you imagine? Here in Germany snow fell almost uninterruptedly from mid-December until about a week ago (and is falling again as of about five minutes ago! grrrr…). Poor Lily must think she’s been exiled to Siberia, out of the frying pan and into the freezer. Not long ago I stepped outside and realized I had forgotten what it felt like to walk on surfaces not covered with ice. We all have coping mechanisms to get us through to the end of winter. The lucky ones buy a plane ticket, pack a bag and jet off someplace warm. Others cozy up to a bottle of wine every night. I, of course, turn to cookbooks. But not just any cookbooks – those that transport me, even without stepping into the kitchen, to someplace I’d rather be. Like, say, Italy. I have a lot of cookbooks about Italy, but today I want to tell you about a new one, a book I probably wouldn’t know about if I hadn’t been sent a copy by the authors, Matthew Scialabba and Melissa Pellegrino. Before I tell you what this book is, though, let me tell you what it’s not. It’s not an introduction to Italian cuisine, or a comprehensive survey of food from boot-strap to toe. It’s not a compilation of long-lost family recipes or a whimsical treatise on how to live la dolce vita. They assume you already have plenty of books that do all these things. It is an exploration of one fascinating aspect of Italy’s gastronomic landscape: the agriturismo. Agritourism is a pretty recent concept, but it’s had a tremendous impact on food culture in Italy. Its existence is also one of the reasons I love the country so much. Agritourism was conceived in the mid-1980s as a way to help keep farming on a small scale viable. At a time when farming everywhere was moving towards conglomerates and corporations, small farmers in Italy hit upon another avenue for profit: open the farms up to tourism, providing lodging, meals, and the chance to experience a centuries-old way of life. It was a stroke of genius, and in the last twenty-five years the scheme has ballooned as increasing numbers of farms join in, and increasing numbers of travelers discover the unique delights of experiencing Italy this way. Though the quality and range of facilities agriturismi offer range from very basic to quite luxurious, thanks to a requirement that agriturismi must make more money from their farming activities than from tourism they are all real working farms, where visitors can get their hands dirty and get to know people who are actively working to preserve Italy’s centuries-old farm-to-table heritage. And this being Italy, guests do not go to bed hungry. I’d go so far as to say that staying in an agriturismo is the next best thing to having your very own Italian grandmother. In my experience this is a way to taste home cooking of the sort travelers rarely do – only that this is better than home cooking, since few home cooks, even in Italy, have their own farms out back providing an endless bounty of fresh (and often organic) vegetables and fruits, meat, cheese and olive oil for the table. And unlike more traditional restaurants who must keep an eye on the bottom line, agriturismi can’t make too much money from feeding people, and the small numbers they feed means they can focus on quality rather than quantity. All this means is that what they offer is some the most delicious, affordable, and inventive food you’ll eat in the entire country. Exactly the kind of food that has been deserving its own book for a while. Thanks to Matthew and Melissa, one now exists. They are a husband and wife team, Americans with Italian heritage who met while both were living in Italy. While there, they fell in love with the humble hospitality and delicious food of agriturismi and decided to spend several months researching them, working in fields and kitchens, making friends and cajoling family recipes out of expert cooks. The book that resulted is part travel guide, part cookbook. Eight regions in northern Italy are represented, from Liguria and Piemonte in the west through to Friulia-Venezia Giulia and the Veneto in the East, and a total of thirty agriturismi. For each one there is an introduction to the people who run it and history behind it, an overview of the farm and facilities, and, most importantly, a selection of recipes. The recipes are as varied as the agriturismi they come from: ricotta-stuffed tomatoes from a centuries-old farmstead in the Ligurian hills, chicken crusted with lavender and pancetta from a farm powered with sustainable energy in the Lombardian countryside, goat cheese gnocchi with walnut sauce from a high-mountain dairy farm in Valle d’Aosta, wild boar ragù from one of the most reknowned wineries in Emilia-Romagna. 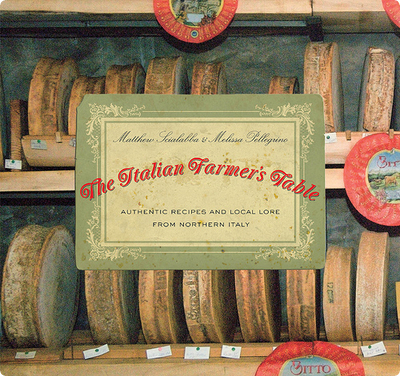 All the recipes are authentic, uncomplicated, and offer a tantalizing sample of the flavors unique to each of these corners of Italy. I have easily two dozen things bookmarked in this lovely book, but when it came time to pick one to share with you I kept turning back to this risotto and its unlikely combination of flavors. Laced with onions caramelized in port and topped with nuggets of blue-veined Gorgonzola, it’s one of the specialties of a hazelnut-growing agriturismo in Piemonte called Ca’ Villa, all of whose recipes tempt me with their flair and imagination. It didn’t disappoint; the combination of sweet wine, pungent onions and creamy cheese made for one of the most exciting risottos I’d eaten in years. Manuel agreed, even though having ‘issues’ with blue cheese he swapped out the gorgonzola for a soft goat cheese, which was sensational too. We ate it out of big bowls with nothing else but a big green salad, but I think it would be exquisite served in daintier portions as the primo piatto of a big Italian feast. Of course the best way I can imagine eating this risotto would be on the terrace of Ca’ Villa itself, but until we find a way to make that happen, I highly recommend settling down with a bowl of it in one hand and this book in the other for a little late-winter armchair escape. News flash! It seems that this little ol’ website has been nominated for ‘Best Culinary Travel Blog’ over at Saveur Magazine’s inaugural food blog awards. Since I’ve been reading this wonderful magazine for its own culinary travel features for as long as I can remember I’m just tickled pink. Of course I would love to have your vote, so if you feel like giving it to me head on over to Saveur where after (a quick and painless) registration you can cast it in nine different categories. Thank you! In a heavy 10-inch sauté pan, melt 3 tablespoons of the butter over medium heat. Add the red onions and cook for about 5 minutes to soften. Sprinkle with a pinch of salt, cover the pan, and reduce the heat to low. Continue to cook for 30 minutes, stirring occasionally. Raise the heat to medium-high and add the port. Simmer the onions and let the port reduce until completely dry, about 25 more minutes. Meanwhile, make the risotto. Heat the chicken broth in a small saucepan to a simmer. In a heavy 12-inch straight-sided sauté pan, add 2 tablespoons of butter and the yellow onion and sauté over medium heat until the onion is tender and translucent but not browned, 8 to 10 minutes. Add the rice and stir to coat with the butter. Cook the rice until opaque, 2 to 3 minutes. Add the vermouth, and let reduce until dry. Add the chicken broth, one ladle at a time, stirring constantly with a wooden spoon until the broth has been completely absorbed by the rice. Continue to ladle broth into the risotto in the same manner, one ladle at a time, and continue stirring until the rice is creamy and al dente, about 15 minutes. Stir in the remaining tablespoon of butter, the parmesan cheese and the caramelized onions. 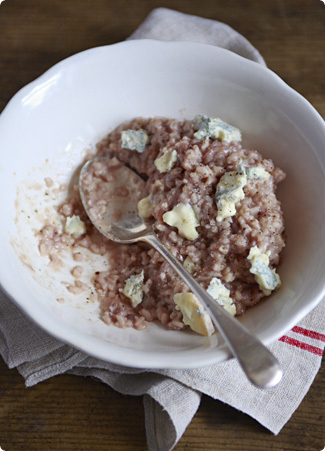 To serve, spoon the risotto into shallow bowls and sprinkle the top with the Gorgonzola. I can’t imagine a better way to one-up March than with caramelized onions, spunky cheese and creamy (pink!) rice. I can’t wait to get on this. Stay warm! This looks like a really good recipe for milking those last indoor days for all their worth. I’m printing it out and taking up to the mountains this weekend. Congratulations! Heading over there now to take a look around. My apartment is bursting at the seams with cookbooks, I’m trying desperately to convince myself I couldn’t possibly need another single one, and then I read this! Sounds like a lovely book and a wonderful idea to focus on the agriturismo. Here in Michigan I’ve been dreaming of Italy as well- our Valentine’s meal consisted of rabbit braised in wine, polenta with roasted garlic and honey, some broccoli raab and a rosemary olive oil cake I just wrote about. It certainly did the trick of transporting us for that evening, but I’m more ready than ever to throw off the shackles of winter this year. So, I never knew that you could have a risotto with gorgonzola, I have the rice, and the gorgonzola and everything else I need to try this recipe. I am going to try this with the dry vermouth, I love the flavor that vermouth leaves as it cooks out of a dish. I think agriturismi are bound to spread, in Europe, at least. They really are an interesting oncept foodwise, even if now – at least in Italy – they some times are a bit of a pointless vogue. Having said that some of the best dinners I had were at agriturismi. The main problem is that most of the recipes I ate there are very difficult to recreate because they rely on ingredients that are often produced there. This risotto is a nice exception though! This is great. I, too, spent some time living close to the land at an organic vegetable farm 2 summers ago. It has forever changed how I Iook at a stalk of broccoli, or even a pea, for that matter! The agriturismo in Italy are widely spreaded from north to south, many people love their easy living, the organic food they produce and bring to the table and so on. I like them too, also if I don’t go very often. This recipe sounds and look really yummy! Congratulations on the nomination! Ciao! As an Italiaphile, I always have one eye on Italy. In fact, I have literally this week booked my summer holiday (to Puglia in Italy) as an antidote to this horrible winter (2 weeks in June… roll on, roll on). We’re staying in a trulli (little conical house) on an agriturismo. I can’t wait.Anyway, I was planning to make risotto tonight to use up some homemade stock. I might have to do a variation on this. So yum! Congratulations to your nomination! God bless!